Former Pakistani PM Benazir Bhutto says she will return to the country "very soon", despite having reached no power-sharing deal with the government. Ms Bhutto had been in talks to become PM again, with beleaguered Gen Pervez Musharraf stepping down as army chief but seeking a new term as president. Ms Bhutto said she would announce the date of her return on 14 September. Another former PM, Nawaz Sharif, has announced he will return on 10 September to challenge Gen Musharraf. Ms Bhutto was speaking at a press conference in London, where she had been meeting key officials of her Pakistan People's Party. 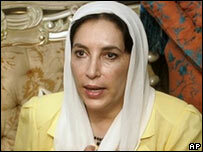 Ms Bhutto said: "We have been in contact with the present regime on the restoration of democracy." She said the talks were "80% successful" but that differences remained on "the sovereignty of parliament and the presidential and parliamentary elections". Ms Bhutto added: "We are making our own plans to return to the country." The BBC's Barbara Plett in Islamabad says by delaying the announcement of her return to 14 September, Ms Bhutto has left a window of opportunity for talks with Gen Musharraf to resume. Ms Bhutto said Pakistan needed "internal reconciliation". "We must return to the roots of moderation and democracy and ensuring governmental authority the length and breadth of the country," she said. There was no immediate statement from Gen Musharraf's office, but senior ruling party officials reacted coolly to Ms Bhutto's announcement. Azim Chaudhry of the Pakistan Muslim League-Q party blamed her for failing to reach a deal with Gen Musharraf, and said "she was asking too many concessions". Deputy Information Minister Tariq Azeem told AFP news agency her announcement was "hollow slogans and rhetoric". Gen Musharraf is seeking support in his hopes to be re-elected as president. But he is under pressure, including from the US, to honour a commitment to stand down as army chief. Gen Musharraf has also suffered a number of legal setbacks, including a Supreme Court ruling that the exiled Mr Sharif can return. Gen Musharraf overthrew Mr Sharif in a coup in 1999. The former PM was jailed for life but then exiled. He could still face arrest when he returns. Under current Pakistani law, prime ministers cannot serve more than two terms - which would disqualify both Ms Bhutto and Mr Sharif. At her press conference, Ms Bhutto said Mr Sharif had embarked on a "personal vendetta" against Gen Musharraf. Ms Bhutto has served two terms as prime minister - from 1988 to 1990 and from 1993 to 1996. She was dismissed for alleged corruption on both occasions but has steadfastly denied all accusations. She left Pakistan in 1999 and has not returned. Although she has not been convicted, corruption charges still hang over her.